Comparing the Development phase and maintenance phase, both has its own unique complexities. But when it comes to maintaining a third party developed application, the complexities grow rapidly. We undertake to challenge these complexities and provide maintenance support to your existing applications. Outsourcing support and maintenance to an off-shore provider reduces cost and allows the mainline team to focus on strategic-direction. We take maintenance contract for duration as small as of 3 months to a relationship beyond the boundaries of time. Regular delivery of new versions as per business and user needs. Fully controllable budget and terms. Well documented application, easy to transfer to any other service provider. 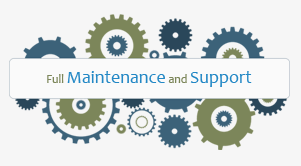 2nd and 3rd level support :- We offer 2nd and 3rd level support services of application developed by Suretek or by any other third party to restore failed services/applications as quickly as possible. 4th level support :- Suretek will professionally develop and implement the new application/software functionality, which may include transformation, migration and extension of your current application or legacy system to keep it usable and relevant to actual customer’s needs.